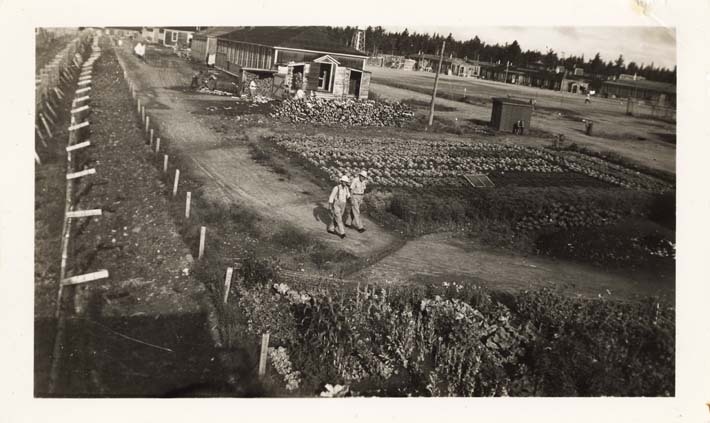 View from above of two men walking through the gardens of a Canadian World War II internment camp. Based on research the camp appears to be Camp Fredericton/Ripples, however this information is not conclusive and there is a possiblity that this could be Camp Petawawa. At the left the barbed wire fence is visible. The garden is visible in the foreground, with a building and pile of wooden logs in the centre background. The barrack buildings and guard tower are visible in the far right of the photograph.